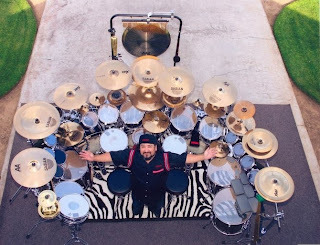 Yesterday, Avenged Sevenfold -- whose drummer James 'the Rev' Sullivan tragically passed away in December 2009 -- announced on their website that they are recording their new album with Dream Theater drummer Mike Portnoy. Avenged Sevenfold said in part: "We asked Jimmy's all time favorite drummer Mike Portnoy to record on behalf of him. Mike said it would be an honor and without question that's what Jim would have wanted. It's comforting to us that someone like Mike, who is undoubtedly revered as one of the best drummers in the world, held such respect and adoration for the Rev's abilities." “These guys are a true family and it is an incredibly emotional experience to be here with them for the first time without their lost brother. But they have welcomed me into the family with open arms and there's a real excitement to make the record they had set out to make. “I am treating my participation on this album with the utmost respect for Jimmy's memory and am remaining as true as possible to the drum parts that he wrote for the songs and the record he wanted to make. “I want their fans to realize that I'm not trying to step into or fill The Rev's shoes...I'm just merely lacing 'em up for him!"